In early autumn Anthropologie suggested it would be good to spend October in Prague. Anthropologie is a catalog, the only one I don’t automatically delete from my inbox. I look at it because I love their imagination, their fantasy, their unwillingness to keep anything the way it was yesterday. It wasn’t so easy when I wanted to get lost there. No one would let me wander alone. What is now the Czech Republic was Czechoslovakia then, a communist regime still in charge. As a western journalist (albeit a ski journalist), I was never allowed to be alone, although the guarding was done gracefully, as if I was being given a guide. In Czechoslovakia to do a story for Skiing Magazine, I had traveled from Vienna to the High Tatra with the story’s Austrian photographer and his wife in their Jaguar. Loving both the photographer and his wife from the moment we’d met the day before (not to mention the Jaguar), I was excited about the assignment. Czechoslovakia possessed (for me) a kind of old world glamour that seemed the stuff of proper novels. The area of our story, the Tatra, is the highest range in the Carpathians, the mountains forming today’s border between Slovakia and Poland. Before World War II, the easily accessible Tatra was a popular skiing, hiking, climbing destination. It remained popular under the communists. But seedier. We crossed the border from Austria on a grey day, arriving mid-afternoon at our erstwhile grand hotel. The rooms were architecturally gorgeous, but the closet doors fell off. The toilet had one of those bands over it showing it was clean, but it hadn’t been flushed. Electric lights were too weak for reading. Heat was provided for three hours in the middle of the day, the hours we were never there. We watched as a bus, parked in front of the hotel as we arrived, disgorged a mass of Russian men in long dark coats. Single file, they entered the hotel. In the days we spent going in and out of the hotel, we never saw them again until the day we left, when single file, in their long dark overcoats, they boarded the bus and drove off. The grey weather remained, snow falling much of the time, mountain slopes and sky united in an almost constant white-out. With such bad visibility, we did little downhill skiing, although we managed a few cross-country routes. 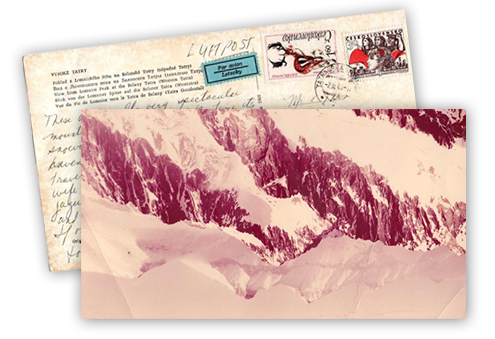 I recently found a postcard (the one pictured above) written to my parents in which I said, “if only the sun would come out we could get some information for our story.” While there was a way in which the grey was romantic, evocative of mystery, of old civilization, Skiing didn’t like the photos. Although the photographer was a world renown Magnum photographer, Skiing said the photos were depressing. They were, of course, great photos, but the magazine, in the business of selling an expensive sport, required sunny slopes and tanned skiers exploding through untracked powder. 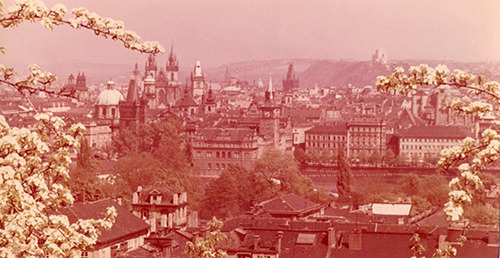 I had planned a visit to Prague after the Tatra. When the photographer and his wife deposited me at the train station for the overnight trip, I felt as if I was leaving home. Finding myself sharing a sleeping compartment with two other women and one man, I knew I’d left home. But my first view of Prague erased the night. It was the picture of the city in every fairy-tale book I’d ever seen. A magical city. The most beautiful city in the world. Without question, a place to wander. Wandering, however, was not allowed. Instead, my “guide” took me to Kafka’s grave where I was photographed by local television as an American writer visiting the grave of an idol. It was shown on local news that same evening, but I missed it because I was attending a performance of La Traviata at the gorgeous Smetana Theatre (today the State Opera ). There was no way I’d pass up Traviata to stay in the hotel so I could watch myself brushing snow off Kafka’s grave. Traviata, sung in Czech, however, is odd. It would be safe to say that it is not meant to be sung in Czech. (Nor English, for that matter. Thank heaven the days of translating opera into the wrong tongue are over. I think.) But I was surprised by the audience. Used to the Metropolitan Opera where, in those days, everyone dressed, it was odd to see people looking as if they had just come from their jobs at local shops, or, perhaps, the state prison. I put it down to some kind of odd equality fostered by communism. Like the sleeping car. I was taken to a nightclub to see an avant garde performance that I can no longer describe, but I remember being grateful for the reminder that art cannot be compromised, no matter the attempt by the fearful, the politically ambitious. But artists in any genre will always find a way. These performers did. I was not watching propaganda, except, perhaps, propaganda for freedom. Alan Ginsberg was in Prague while I was there. I couldn’t imagine him being guided, guarded (look how similar those two words are!) every moment. I imagined him sitting in cafes talking to poets. Why couldn’t I sit in cafes talking to poets? I imagined sneaking out of the hotel, finding my way to some artists’ café, running into Ginsberg, engaging in this city through this man who refused boundaries. Couldn’t we talk about “the best minds of my generation”? No one, I imagined, would keep Ginsberg from wandering. Did that mean there was something essentially puerile about what I wrote? The Carpathians in a blizzard did not seem trivial to me. Was that somehow indicative of the narrowness of my world? Probably no one would ski “starving, hysterical, naked.” I remembered once being more concerned with art than with skiing. Before I became a skier, of course. Had the pristine mountain world of skiing simply wiped out the dark cafes of teeming cities, the places where people talked? Gliding down the pure white of steep slopes, had I abandoned my own concern with some necessary madness? with some essential destruction of what passed for sane in the world around me? It wasn’t that I couldn’t see it, but on skis, it no longer seemed to matter. Ever so slightly missing the Beat world, arriving at its edges just too late to enter, I had merely gone on, climbing mountains as a way to get high. By the time I got off the train in Prague, the Beats were merely one more subject for college English classes. And yet, how badly I wanted to slip my guard to find Alan Ginsberg in a Prague café.